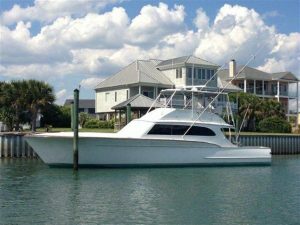 Price reduced on this 61' Buddy Davis yacht for sale in Myrtle Beach! : Atlantic Yacht & Ship, Inc.
Word just came in from Chris Carroll that the price has been reduced on his used 61′ Buddy Davis for sale. In the first place, this is a rare opportunity. The opportunity is to own a professionally maintained fishing machine! Additionally, tshe owner is motivated to sell. Furthermore he will consider trades of smaller vessels. The starboard engine was just rebuilt April 2014. Additionally the wet turbo was replaced along with the exhaust manifolds. In fact, this a motivated seller asking $324,000 so make an offer! The Egg Harbor City, New Jersey based Buddy Davis Yachts are still built in the Carolina tradition. The yachts are all semi-custom with each vessel having her own personality. For the past 28 years they have been building quality yachts which are characterized by the finest rough-water riding hulls on the ocean. In addition to the superior performance characteristic, a Buddy Davis also stands out from other sport fishing yachts. Due to its uniquely attractive bow flare, smooth flowing lines, and fine crafted interiors. The company firmly believes that the best boats are built completely in one facility. From start to finish, by expert craftsmen in order to achieve the highest standards possible. For more information on this used 61′ Buddy Davis contact Chris Carroll today! For over 53 years Atlantic Yacht & Ship has been serving the yachting community. Our headquarter sales office is dockside at Harbour Towne Marina. That is in the heart of the yachting capital of the world, Fort Lauderdale, FL. Our in-house waterside service department provides general yacht services. These range from new teak, to engine rebuilds, captain services, and everything in between. Whether purchasing or marketing a quality vessel, Atlantic Yacht and Ship, Inc. is your one stop resource. We have the highest quality service and sales in the yachting industry today. If you are looking at yachts for sale, or thinking about selling your yacht, it is always wise to have an experienced broker representing your interests throughout the deal. Contact Atlantic Yacht & Ship at 954.921.1500 or click here.